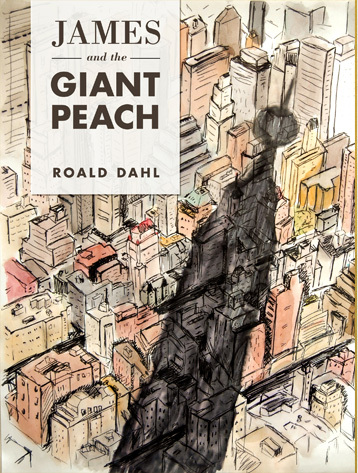 Roald Dahl’s stories, including James and the Giant Peach, were important literary contributions to my childhood. The illustrations that accompany many of this stories are almost branded to his name in my mind so I wanted to create a new cover for James and the Giant Peach that referenced this illustration style while catering to an older audience who are more familiar with the story. This cover doesn’t depict any of the characters in the book (unless you count the Empire State Building or the peach itself) but instead is laid out from the perspective of the characters in this scene. Perched atop the Empire State Building, James and his comrades would have been able to see the whole city as well as their own shadow.